EN VEDETTE SUR LES CHASSEURS DE L'ÎLE HGTV POUR LES LOCATIONS D'ÎLES DE LUXE LE 31 JANVIER 2014 17 H 30 EST! 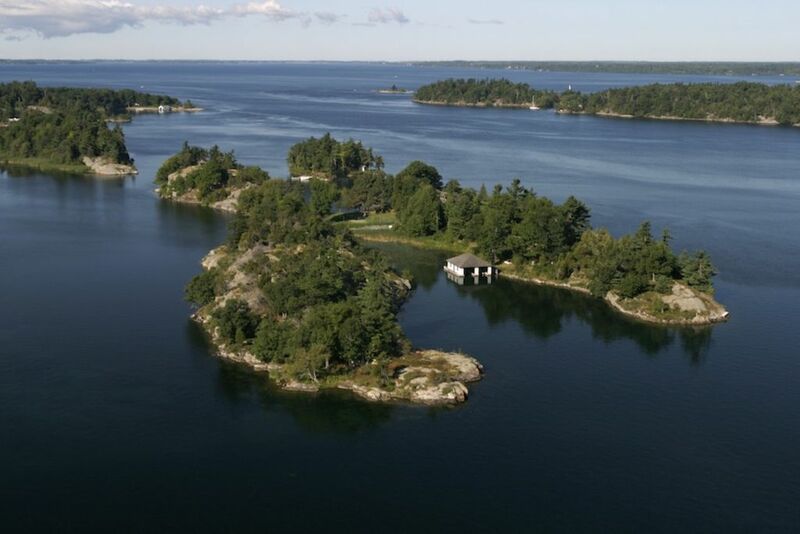 8 acres île privée à St. Lawrence River, 1 mi. du Canada, 8 mi. de Clayton, NY. Maison peut accueillir 15 w / 6 BR + chambre avec lits superposés, 3 et 1/2 salles de bains; les invités peuvent apporter leur propre tente pour installer sur la tente plate-forme tente w / pont. Vue à 360 degrés sur la rivière, portes vitrées du sol au plafond, 2 cheminées, plafond cathédrale, TV LCD 48 pouces avec chaîne sport, table de salle à manger 10, cuisinière Aga, réfrigérateur, congélateur séparé, cafetière, micro-ondes, lave-vaisselle. Laveuse / sécheuse. Internet haute vitesse, chauffage électrique. 2 grandes terrasses (avant / coucher du soleil, lever du soleil) w / table, sièges, grill, court de tennis privé Har tru, terrains de basket et de volley. 2 ports protégés naturels, hangar à bateaux et plusieurs quais, radeau de natation et plate-forme, gazebo en pierre avec un des points les plus élevés sur la rivière. 2 kayaks de mer, 2 planches de paddle; bateau à moteur non inclus mais peut être loué à Clayton. Jolly Island est 1/2 mile de Potter's Beach et 1/2 mile de 40 Acre Shoals, le site des maskinongés record du monde. I have read some of the reviews before booking and I’m glad I ignored most of them that were negative. Will probably book again next year. The property has character and enough room to roam. Just to be real my party was made up of myself and 4 other guys. We have all grown up together and have know each other for 60 years. Fishing was fun. Rooms were acceptable. Rented a boat from Clayton marina. Also very nice people. Communication with the owner/ manager were spot on. For each of the past 2 summers, our family has had the privilege of spending 10 days on Jolly Island. In summary, we love Jolly Island and cannot say enough positive things about our experiences there. Swimming, kayaking, paddleboarding, sailing, basketball, tennis, croquet, hiking, or just relaxing and watching the boats go by - Jolly Island has it all and then some. And it doesn't hurt that the surrounding area offers so much. It would be very difficult to find a place equal to Jolly, particularly when it comes to enjoying time with family and friends, and making memories. It clearly has been and is a very special place for the family that owns it. We cannot recommend Jolly Island highly enough and look forward to a few if not many more stays in the coming years. HGTV needs to get back there!!!! We were disappointed in the house. The refrigerator did not keep things cold enough, and it took two days to get the oven to the correct temperature, there was a freezer off the walk in basement living quarters which at night was not an easy treck. We had to go outside to enter all the bedrooms and they were not clean. The living room was okay, there were ten of us there and not enough comfortable seating. The tennis court and basketball court has a lot be desired. The showers did not drain well. The screens are all in bad shape, we understand that there will be bugs, but we do not have to help them out. The day before we left the outside maintenance team showed up to do lawn work, the girls were out sunbathing and there were people napping. What if we of not been at the house, there is no way to lock any of the doors, and we all had cash and other items in our bedrooms. The owner was very quick to get back to us when we had issues. There is so much potential in this place, it could be beautiful!! Great place to go with friends. Host was very responsive and helpful. We met 2 other families at this home and had a wonderful stay! Home is well equip with all the essentials ! This is a older home with lots of character. The negative previous reviews had been fixed such as plenty of coffee cups and new couch slip covers. We spent most of the day outside with views all around. The kids really enjoyed exploring the island . We had camp fires every night by the river and it was beautiful. The bed rooms are all seperate from the living space, giving plenty of privacy. If i had to say one negative it would be the bugs outside! Lots of mosquitoes/ sandflies but luckily we found some bug spray in the house! If you dont own a boat, you must rent a water taxi to get to the island...which is what we did. We enjoyed our stay. I've been vacationing in the thousand islands for 41 years and this is the best place we have ever stayed. We had 8 men for our annual fishing trip and each of us loved Jolly Island. There were enough beds for each of us and the dining room could easily accommodate all of us in a house filled with charm and history. We had good internet connection and clear television. Great outdoor grill and deck space. We enjoyed playing basketball , exploring the island and fishing from shore . We spent less time in our boat this year because Jolly Island was so much fun. We are already planning on returning next year.